The match hosted by East Kilbride Community Trust was a huge success. Although Scottish Football has experienced some of the high profile instances of racism that we have see in other countries, it is important we do not be come complacent. Show Racism the Red card is doing excellent work in Scotland to combat racism and I am happy to give the campaign my full backing, thanks to everyone who has also turned out today to show their support. Young people from local primary’s Blacklaw and St Hilary’s joined the Show Racism the Red Card team in the morning for an interactive workshop learning about the causes and consequences of racism and how we all have a part to play in combating racism. The young people from the primary schools got the opportunity to enjoy some fun and fitness coaching with Derek Ferguson, Steven Bell and Robbie Winters before cheering on the ex-professional and media teams from the stands. The 10th Fortnight of Action in Scotland makes a stand against racism and sectarianism. There is a pressing need at this time to stress both the anti-sectarianism and anti-racism message, given that recent incidents have once again highlighted the problems in our communities. Show Racism the Red Card is a partner of the Football Against Racism in Europe (FARE) network and the Fortnight of Action is Scotland’s contribution to the 13th annual FARE Week of Action against racism and discrimination, taking place Europe-wide. Across the fortnight, every Scottish Premier League and Scottish Football League club will be united in calling for an end to racism and sectarianism in football, and wider Scottish Society. The ‘Show Racism and Bigotry the Red Card’ message will have a strong presence at all fixtures. 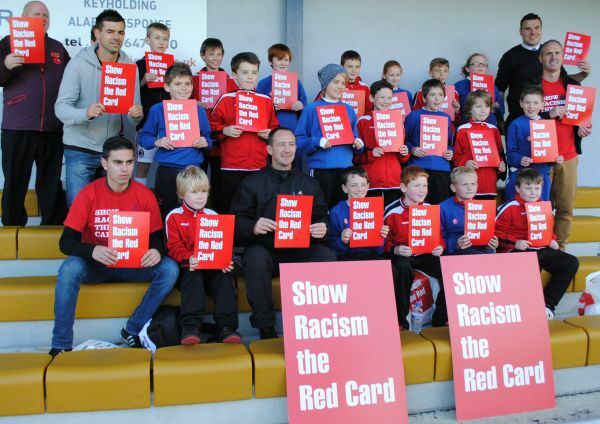 Ex-Professional Footballers who pulled on their boots to support Show Racism the Red Card’s Fortnight of Action included: Andy Walker, Jack Ross, Gerry McCabe, Jim Duffy, Lee Sharp, Brian McPhee to name a few. Craig Brown also joined the teams to present the trophy and congratulate everyone who took part in showing their support for the campaign. For more information about our Fortnight of Action click here.